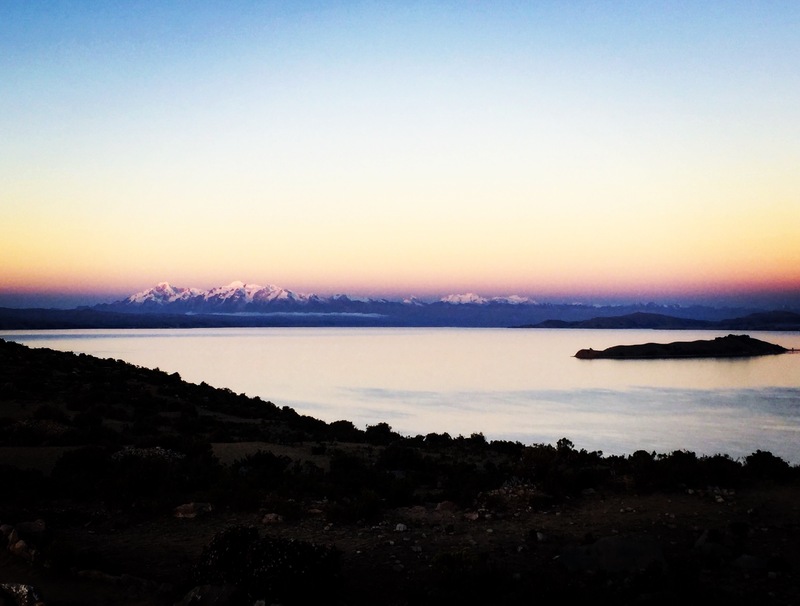 Lake Titicaca is famous for being the world’s highest altitude lake (3,812m) but once you visit, you soon realise there’s much more than just a lack of oxygen to make you breathless. 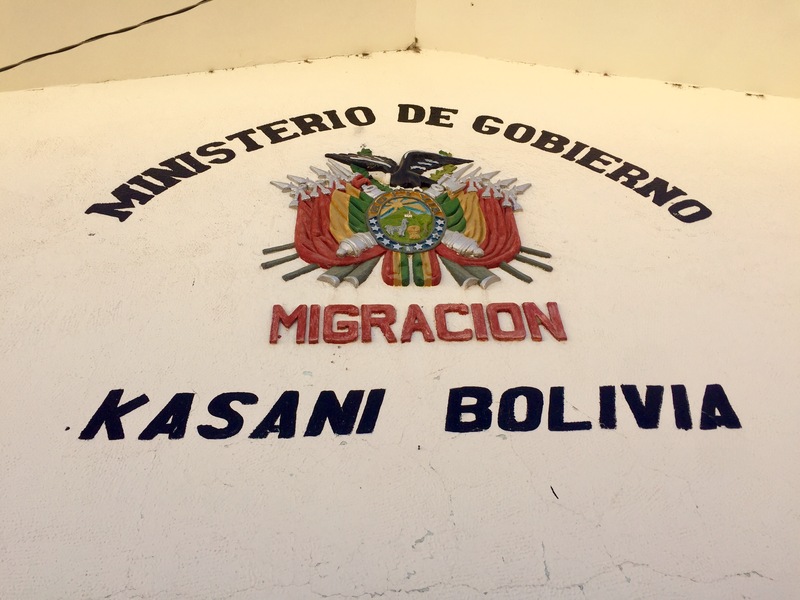 Luckily for me, I was still mostly on schedule with my route so I could visit both the Peruvian and Bolivian sides of the lake – oddly the border crosses the middle of the lake, cutting it in half. 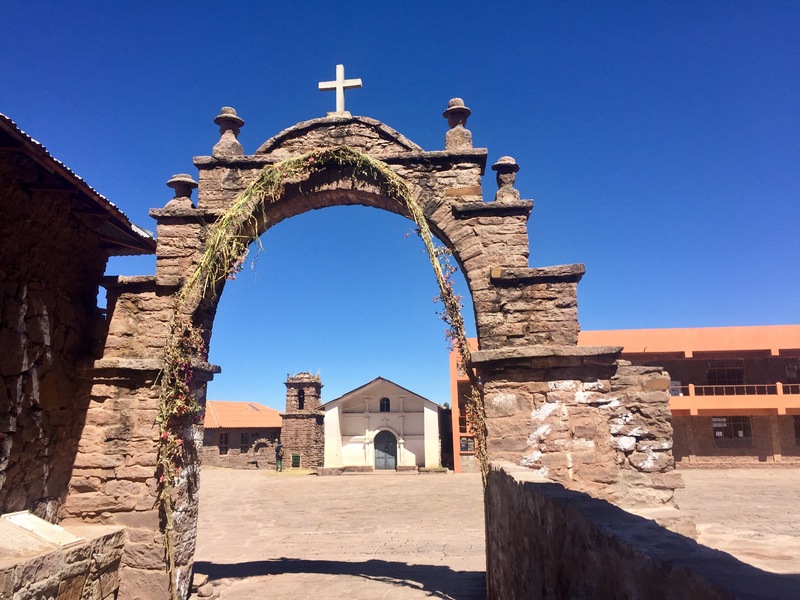 I started out in Puno on the Peruvian side with a day trip offered by my hostel before heading across the border to Copacabana (not to be confused with the popular beach in Brazil – a momentary lapse of brain power). 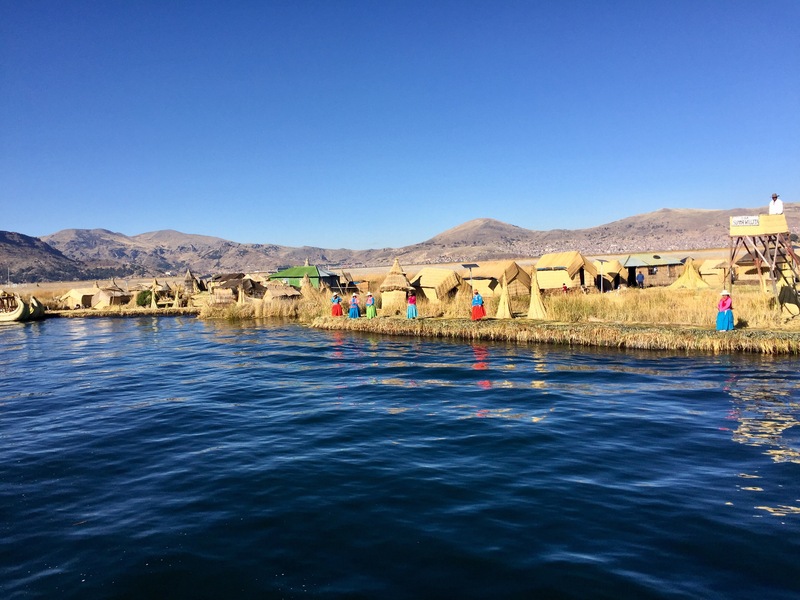 The day trip from Puno included a boat trip to the Uros islands – famous as the floating islands with over 2,500 indigenous people still living there – and Taquile island. 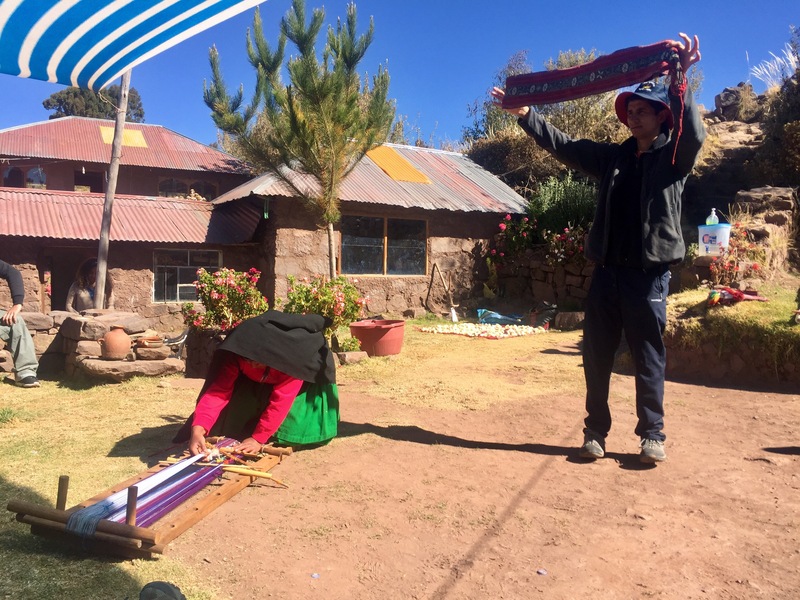 Having scrimped on a cheap bus to Puno (20 soles for 10 hours) I was able to cover the cost of the whole day trip in the price it would have cost to by a tourist bus ticket (80 soles). This made me quite smug, like a proper traveller rather than a tourist. However, the island trip definitely makes you feel like a tourist. 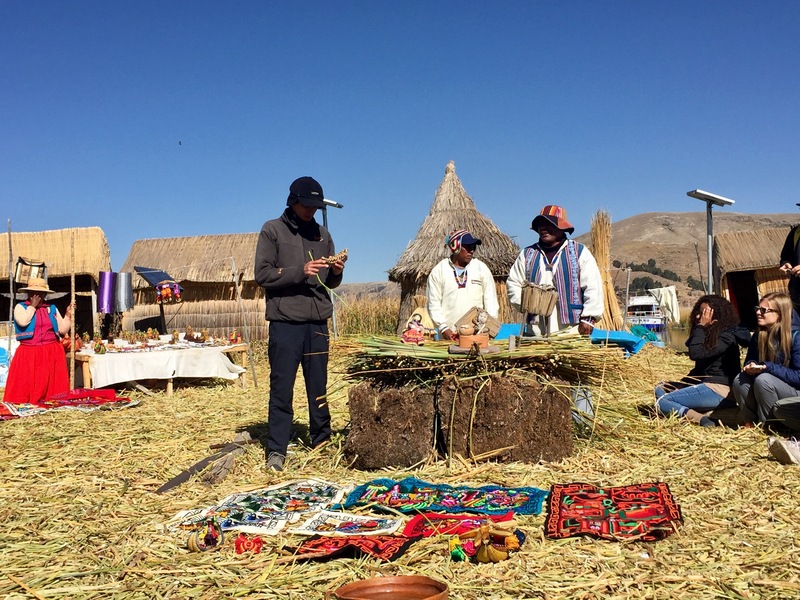 The Uros islands are becoming less authentic as time passes and their main income becomes tourism. I had been warned by my trusty Lonely Planet bible that some travellers don’t enjoy the commercialisation of these islands and I have to agree with that – although it was still a truly interesting experience to visit the islands. All the women are dressed in bright, traditional clothes and welcome you to the islands with waves and singing. After a brief look around you’re given the option of a short boat ride in a traditional boat made of totora reeds powered by hand. This is probably just another way for them to gain a bit of extra cash as it’s hard to believe the locals actually still use these but it was still nice – when it only costs about £2.20 it’s hard to turn it down. After the boat ride you go back to your island and are given a short talk by the tour guide and island president on how the islands are built and maintained. This was probably the most interesting part of the visit for me. The base is constructed from blocks of roots from the totora reed plants – also used to create the homes and boats. The blocks are tied together using large bamboo rods that are stuck through the blocks. On top of this they lay many layers of the reeds in opposite directions which are replaced every 15 days. When you walk about on the islands they feel spongey and kind of wobbly – definitely not like any other islands I’ve been to before. 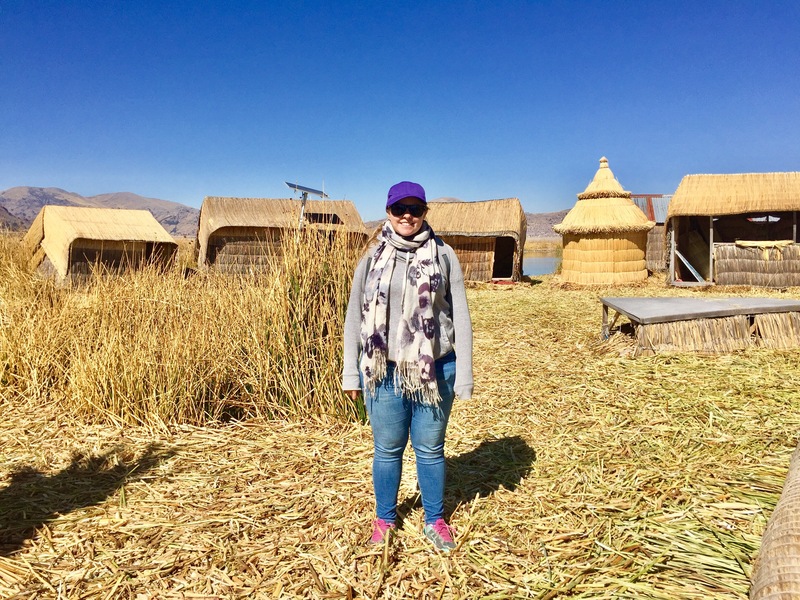 It was interesting to learn how the Uru have lived on these floating islands since the Incas invaded their lands but the historical important of these islands is steadily flushing away. It’s hard to see how fixated these communities are by monetary opportunities and in part I did feel guilty for contributing to this. 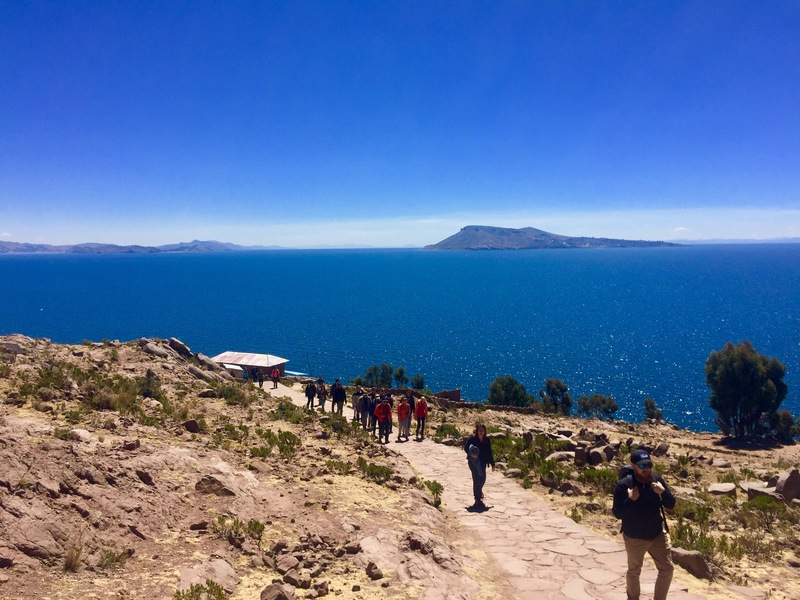 Next we hopped back onto the boat and went to see Taquile, one of the northern islands of Lake Titicaca (not a floating island, just a normal island). This island gives you a much more comfortable feeling about the tourism here. It a naturally beautiful place and the terraces and stone archways add to this. The clear blue waters and bright blue sky trap the dusty yellow and green island in the horizon. Other than a small square and crumbling church, there isn’t much to see other than the stunning views. We had a traditional lunch on the island and learnt about the local weaving and marriage customs. The next day I was up early to take a short bus journey across the border to Copacabana on the Bolivian side of the lake. This border crossing was my quickest so far, taking less than half an hour in total. 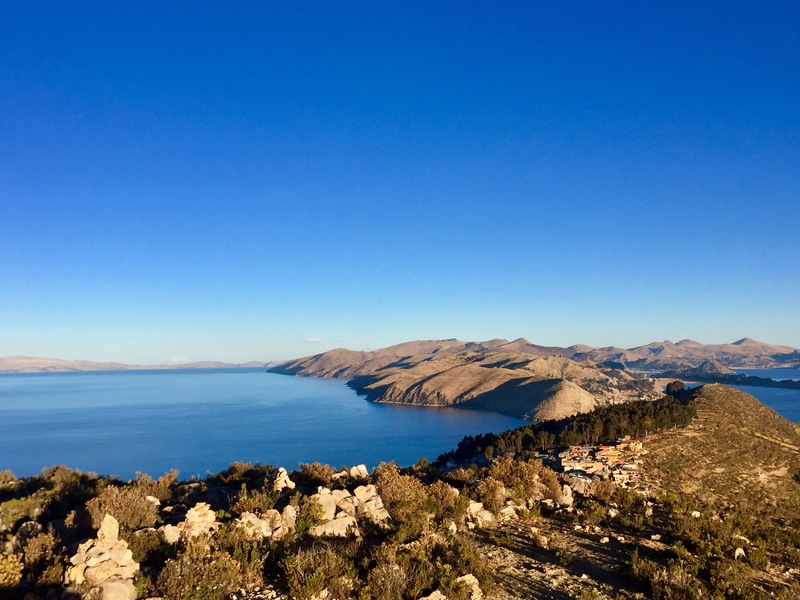 Copacabana is the main Bolivian town to visit the lake from and boats depart for the Isla del Sol twice daily. Most travellers skip Copacabana entirely, heading straight for the island and then straight to La Paz when they return. Although this wasn’t my original plan, it did turn out to be what I ended up doing – other than stopping for lunch at a nice gringo cafe called La Choza. 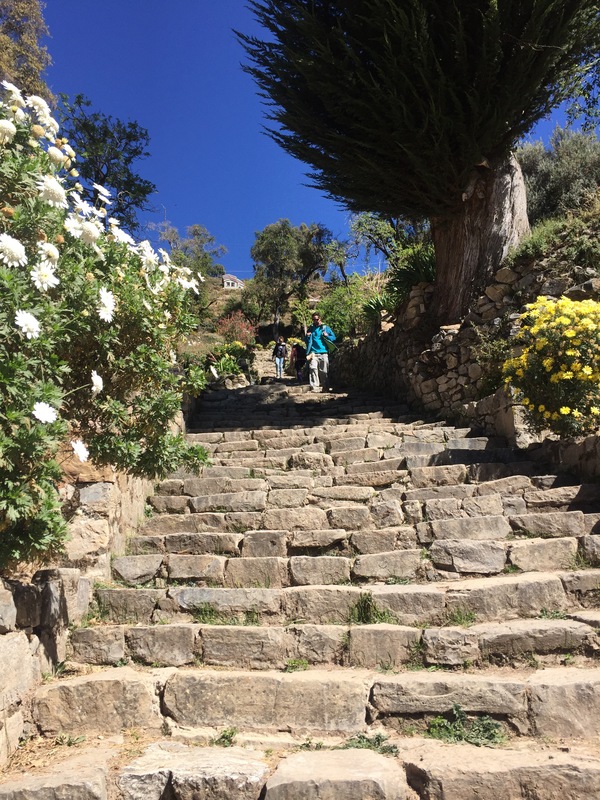 The Isla del Sol welcomes you with a very steep climb up the restored Inca stairway. With my main backpack and day pack it was quite a climb but since the north of the island was closed due to protests, I wasn’t in too much of a rush (most of the interesting ruins are in the north). I wondered around for a while looking for a hostel (Hostelworld is a real let down here so I pitched up without accommodation). The hill is filled with hostels and hotels though, in fact this is basically all there is on the island, except for restaurants. I put my Spanish to the test finding a room for one at a reasonable price but managed to find a nice double room for £6 a night – probably more luck than skill. 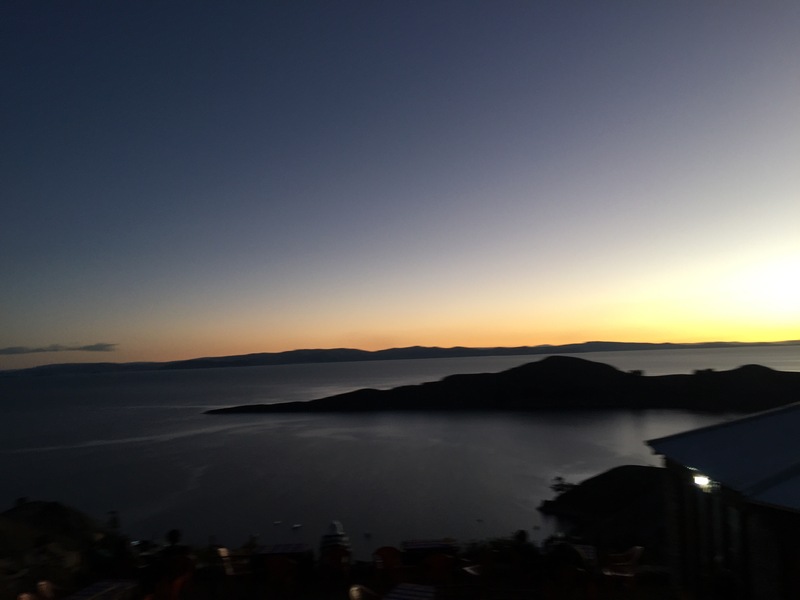 I walked to the viewpoint at the top of the island for the beautiful sunset and somehow didn’t find the altitude all that hard – maybe I am getting used to it. I met some Aussies also enjoying the sunset who had just finished ski seasons at Whistler in Canada which was great for me as that’s where I’m hoping to go in November. So I bombarded them with lots of question while we waited for the sun to go down. The stunning views were some of the best I’ve seen and the weather was clear so you could see across to the snowcapped mountains near La Paz and probably back to Peru if I knew where to look. On the way back to my hostel I was also lucky enough to see the stars as clear as I had in Colca Canyon too. In the end I only stayed on the island for one night and arrived back in Copacabana by midday. I went back to the same cafe for lunch and bought a bus ticket to La Paz. This is where the madness started. The road to La Paz was blocked by protesters so the simple three to four hour journey turned into a five to six hour journey, including driving back to Peru, around the lake and then back into Bolivia. Well, I’d only been in Bolivia for about 20 hours by this point so it felt weird to know I was going back to Peru so soon. Very luckily for me, being British means I don’t have to pay for a visa or entrance fees so other than three times the paper work, it didn’t cause me too many issues. But for the South Africans on the bus this was a nightmare as they’d have to pay again to enter Bolivia, and it’s not cheap for them. I was very glad that the Puno border is so easy to cross because I would not have wanted to queue for hours to get back into Peru and then back into Bolivia. 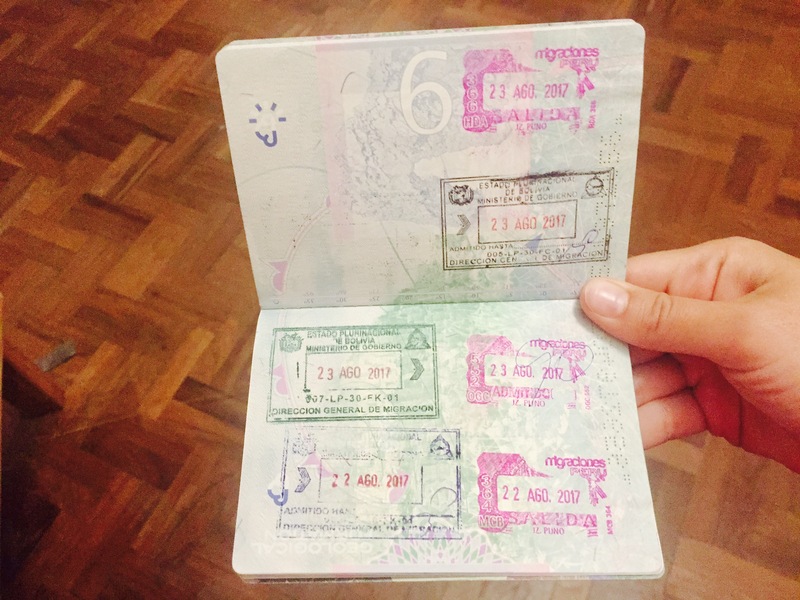 There was once hairy moment getting out of Peru the second time where the immigration officer wasn’t happy with my passport – probably because I had so many stamps for the same border in the space of two days. But after 10 minutes of awkward waiting around, he decided it was fine so I ran off with my stamp and bags to Bolivia before he could change his mind. Now I have two pages in my passport dedicated to this crazy border hopping experience but at least it’s a relatively new passport so there’s still lots of space for the adventures still to come!